There will be a lot of losers if the House GOP’s disastrous plan to repeal and replace the Affordable Care Act ever becomes law: people with preexisting medical conditions, working families, older folks, kids. One of the few winners would be the nation’s pharmaceutical industry: $28 billion richer thanks to a big tax cut. The Senate is likely to keep this tax break in its version of the legislation. 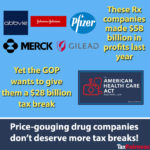 Do America’s drug makers deserve a $28 billion tax cut over 10 years, when the profits of the top 10 companies topped $83 billion last year alone, with the top 5 pocketing nearly $58 billion? Hardly. In fact, they need to start paying their fair share. The Republican plan passed by the House and endorsed by President Trump this spring would cost 23 million Americans their health care while handing out $660 billion in tax cuts, mostly to wealthy individuals and big health-care companies. Drug companies already avoid paying their fair share of taxes, even as they pump up their profits by price-gouging public health systems and individual patients. And let’s not forget about the massive subsidies they get for federally-funded research that leads to new and lucrative drug discoveries. Pharmaceutical companies are among the biggest offshore tax dodgers. Three drug firms—Pfizer, Johnson & Johnson, and Merck—are among the top 10 American corporations stashing earnings offshore to avoid U.S. taxes. Pfizer (maker of Celebrex, Lipitor, and Viagra) alone has some $200 billion in profits parked offshore, much of it presumably in tax havens. A big chunk of Gilead’s stashed profits came from hepatitis cures priced so high that hundreds of thousands of patients went untreated even as the federal government was laying out billions of dollars a year for Gilead’s drugs. Last year, Pfizer tried to renounce its American identity in order to dodge $35 billion in U.S. taxes, even though it’s prospered here for over 150 years and gets about a billion dollars annually in federal contracts. Big Pharma has been getting fat off American consumers and public health systems for years. Prescription drug prices have surged eight times faster than the general rate of inflation over the past decade. The expansion of health-care coverage to 20 million people by the Affordable Care Act has been paid for in part through taxes on health care companies, including drug firms, which have benefitted from millions of new customers. The GOP plan would eliminate those taxes, in the process stripping care away from millions of Americans. That’s not a prescription for a healthy society. Seniors, children, people with disabilities, and working-class families need the affordable, quality coverage offered by the ACA. And America’s profit-laden drug companies need to help pay for it. Will Rice is a senior writer for Americans for Tax Fairness.